A a high-end, top quality interactive estate agent’s site built using WordPress – but with all the property listing information fed from another system. 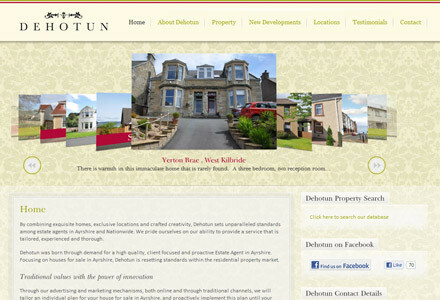 Dehotun use the Vebralive estate agent’s software package to manage their client listings. Quite rightly, they don’t want their operatives to have to type the same information into more than one system, so the information shown in the website is fed from Vebra via a nightly batch run and executed using a cronjob. This is effectively a personalised property portal.